Write to comationinc@yahoo.com with questions or comments about this web site. The all encompassing software allows the client to move fluently through all layers of access. This system allows a client to completely and seamlessly maneuver through all activities such as writing and printing a document from a communication page, sending and receiving text messages and taking a picture or video and adding text from your communication pages. With a endless amount of IR memory, this system can have any amount of preset or direct selected TV channels, stereos and DVDs while still having communication on the same page. The possibilities are endless. Through the Rolltalk you can truly be independent in your environment, no more multiple layers and changing screens or formats to print, call, and communicate. This is an amazing hand held device with quite a voice. 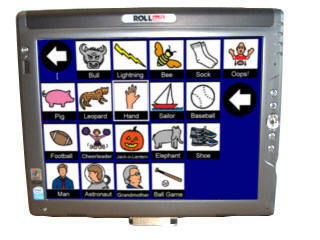 It is an augmentative communication device that allows you to communicate, and have unlimited environmental control. It comes with the amazing Rolltalk software so creating custom pages is a breeze. It can be accessed through switch scanning or touch screen. The all encompassing software allows a client to move fluently through all layers of access. With the Rolltalk software you can build custom pages for communication and multiple layers all on one screen. It has the power of the Rolltalk workshop without IR capabilities. This system has the power of a mini and a nice compact size. The Rolltalk Lite’s size makes it very transportable and the screen clarity is unmatched. It has unlimited IR functions, cell phone sms, and communication with the power of Rolltalk software.